"The launch of a Delta II rocket carrying NASA's Gravity Recovery and Interior Laboratory (GRAIL) has been postponed one day to allow additional time to review propulsion system data from Thursday's detanking operation after the launch attempt was scrubbed due to upper level winds. 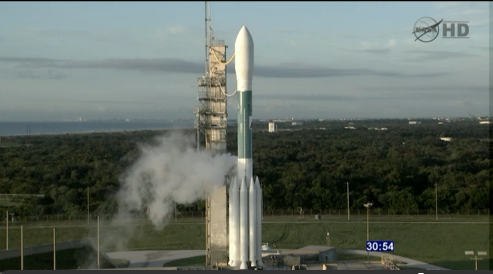 The postponement will allow the launch team additional time to review the data. The launch now is planned for Saturday, Sept. 10, from Space Launch Complex-17B at Cape Canaveral Air Force Station, Fla. There are two instantaneous launch opportunities at 8:29:45 a.m. and 9:08:52 a.m. EDT (5:29:45 a.m. and 6:08:52 a.m. PDT). The forecast for Sept. 10 shows a 60 percent chance of favorable weather conditions for a Saturday morning launch."